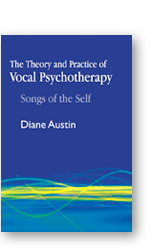 Vocal Psychotherapy is a new model of music psychotherapy developed by Dr. Diane Austin. After more than 25 years working as a music psychotherapist in private practice with adolescents and adults, Austin’s clinical practice and research led to the conclusion that the voice is a, if not the, primary instrument, and that singing is one of the most effective ways to build a connection to one’s innermost self and to others. Vocal Psychotherapy is the use of the breath, natural sounds, vocal improvisation, songs and dialogue within a client and therapist relationship to facilitate intrapsychic and interpersonal change and growth. It combines the ideas and theories of depth psychology with the practice of vocal music therapy. This model includes vocal holding techniques©, free associative singing© and other techniques for accessing conscious and unconscious feelings, memories and associations. Vocal Holding Techniques is the name ascribed to a method of vocal improvisation I have been developing and refining since 1994 (Austin 1996; Austin 1998; Austin 1999; Austin 2001). Vocal holding techniques involve the intentional use of two chords in combination with the therapist’s voice in order to create a consistent and stable musical environment that facilitates improvised singing within the client therapist relationship. The therapist uses unison, harmony, mirroring and grounding to support the client in a developmentally based process. This method provides a reliable, safe structure for the client who is afraid or unused to improvising. Vocal holding techniques also support a connection to self and other and can be used to promote a therapeutic regression in which early injuries to the self can eventually be repaired. Free Associative Singing occurs when words enter the vocal improvisation. The process is spontaneous and the client is free associating in the moment. The therapist is contributing to the process by doubling the client’s lyrics (single words or phrases) in the first person but also by offering questions or posing interpretations. An example is the client sings “she is critical” and the therapist sings, “ yes, she is critical…like my mother.” Because of the continuous flow of the music and the simple harmonic structure as well as the therapist’s lyric contributions and vocal support (singing in unison, harmony, mirroring etc. ), this method can easily access unconscious feelings, sensations, memories and associations so they can be processed and integrated into a more complete sense of self.